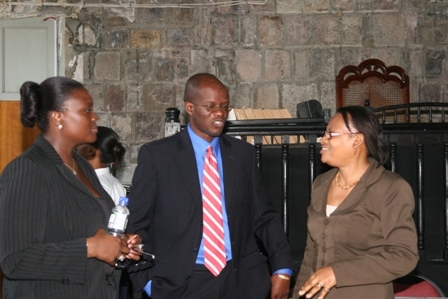 CHARLESTOWN NEVIS (March 18, 2010) — Attorney General and Minister of Legal Affairs and Justice Hon. 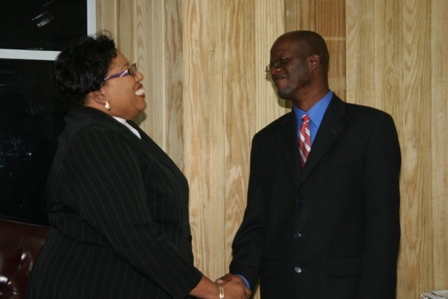 Patrice Nisbett paid courtesy calls on Resident High Court Judge on Nevis Her Worship Ianthea Leigertwood-Octave and Magistrate of the Charlestown Magistrates’ Court District “C” on Thursday, in what he described as a historic visit to discuss matters of mutual interest and concern. Mr. Nisbett accompanied by his Permanent Secretary Mrs. Ryllis Vasquez, told the Department of Information he thought it prudent in his new capacity, to visit the judiciary. “The visit today is a visit that I understand is a historic visit. It is the first time that the Attorney general is making a courtesy call here on the Judiciary here on Nevis and the staff of the Registry. “What we plan to do is to make this an annual visit so that one can sit with whoever is the Judge at the time and the Registry and we can be able to hear what the concerns and issues are and how they can be addressed in a timely and effective manner,” he said. At the end of his meeting with the Judge he said she had asked for certain matters to be addressed which would allow the administration of Justice in St. Kitts and Nevis to be operated in a much more efficient manner. “In discussing with Her Ladyship this morning, I indicated to here that the government of St. Kitts and Nevis continues to recognise the importance of the Separation of Powers Doctrine and we have always operated with a sense of cordiality cooperation between the Executive and the Judiciary. In order for the system to operate effectively, there must be mutual respect. “We also discussed the court facilities here at Charlestown [and] the High Court. She raised some concerns about the existing facilities and one of the important concerns she raised was the issue of space and how one can improve the space situation so that the staff of the court can function in a more efficient and effective manner,” he said. The Attorney General said he was aware that the system was delay prone and the Attorney General’s Chambers and the Ministry of Justice would endeavour to do whatever was necessary to ensure an efficient judicial system. With regard to the prospects of a new High Court, Mr. Nisbett said there were plans for the establishment of a new Hall of Justice in Nevis. “As a matter of fact there is a project and I know there are a number of persons here in Nevis who presently sit on a committee. I think that they are in the process of evaluating the project and doing the various assessments. Maybe someday we will be able to make some announcement to the general public as to this project. On the issue of the provision of a law library which had been nonexistent in the Nevis Jurisdiction, the Attorney General said it was a matter discussed at the meeting with the Judge and they had arrived at an interim solution. “What we have basically agreed is that there must be some level of consolidation with regards to library resources and we must use the technology that is available in order to ensure that one has access to the necessary material. So we will be using the electronic side of things in order to deal with the establishment of the library facilities. “We also believe that with the Halls of Justice project, there will be adequate space made available for the site of a possible law library but in the meantime, the Legal Department here in Nevis, will continue to ensure that material is available. Each year they will continue to update the material that they have, to ensure that there is some level of law library facility here in Nevis so that the legal fraternity can have access to that,” he said. 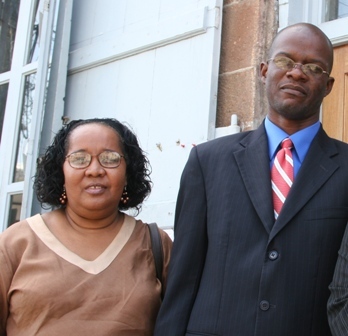 His call on Magistrate Clarke addressed issues and concerns that were relevant to the operation of the Magistracy in Nevis.